A lot of business email servers only allow 5-10MB attachments, but today it’s not uncommon to need to send a much larger file to a friend or colleague. 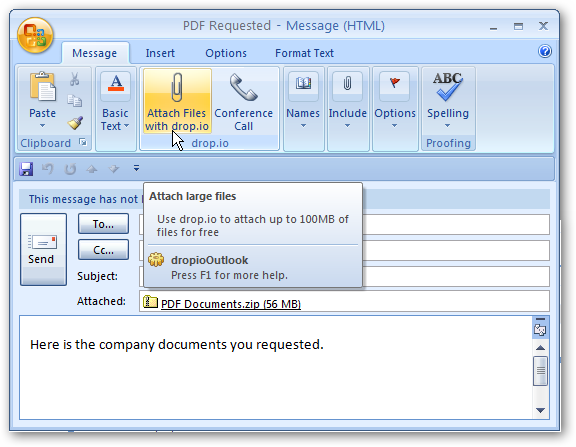 Thanks to drop.io and their new Outlook plug-in, you can now send up to 100MB attachments for free. Drop.io offers a unique file-sharing and collaboration platform. 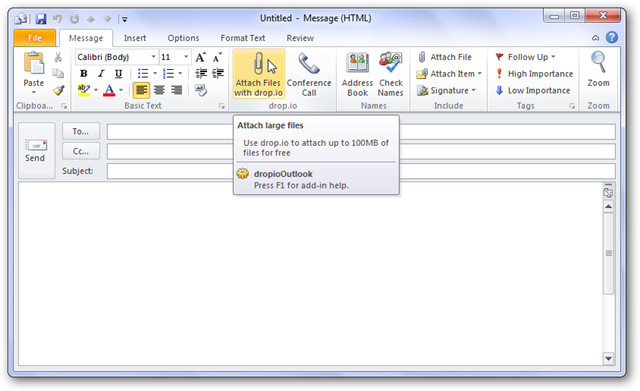 With their Outlook plug-in, you can use this system to send larger files directly from Outlook. Drop.io is free for up to 100MB of storage; if you need to send larger files than that, you can upgrade to a professional account. This plugin is still in beta and for this article, we ran the plug-in in Outlook 2010 64-bit version. 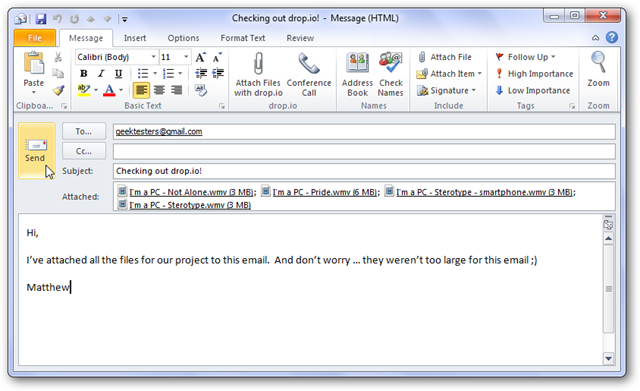 We have tested it on Outlook 2007 as well and it works fine in both versions. First, download the Outlook plug-in and install it. The installer is very simple, and the setup only took a couple seconds. 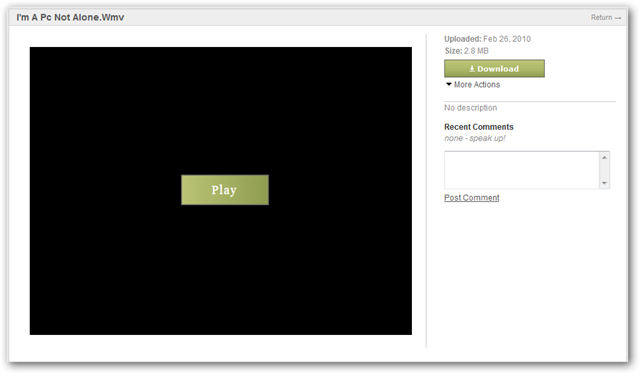 The installer will have to download the rest of the plugin, but even still it was very quick. 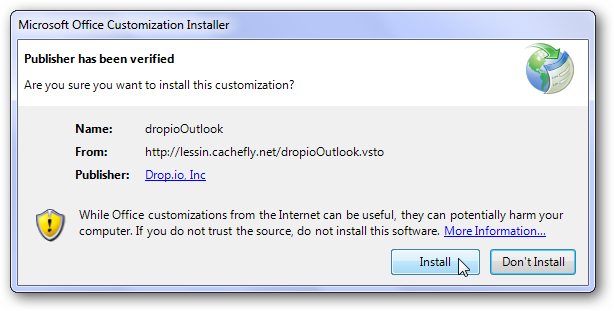 Please exit Outlook before running the installer. Once this is finished, open Outlook and click New Email to check it out. To attach your files, click the new “Attach Files with drop.io” button. This will open an Explorer window. Add any files you want, and compose your message. Simply send as normal, and all of the files will be included in the email. There is no third step; it’s as simple as sending attachments with a normal email. 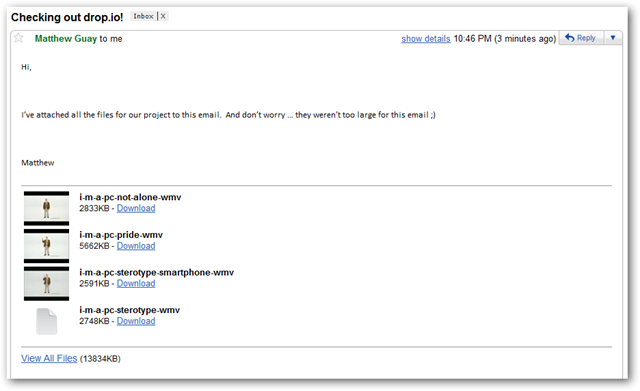 Here’s how the email looks when the recipient receives it. It shows the files I attached, and has a download link for each one. It also has a download link for all the files, so the recipient can quickly get all the files we sent. The download link takes them to a page where they can either just view the file online or download it. Drop.io also allows offers free conference calls through their platform. You can add a conference call number to your email so you and your colleagues can talk about your project. 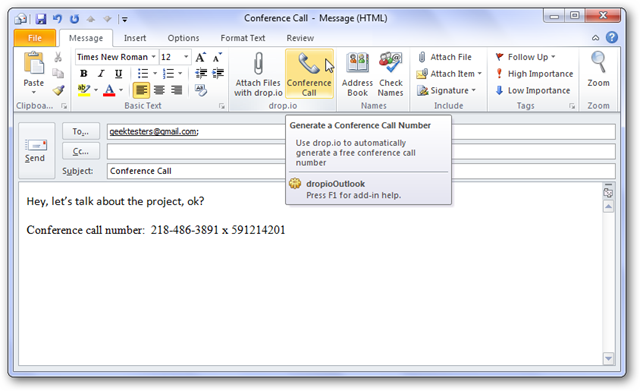 Simply click the “Conference Call” button to add a unique conference call number to your email. The Drop.io plugin gives you an easy way to send larger files directly from Outlook, and then helps you collaborate on them. This can be very helpful in situations where you need to send large attachments. Even though it’s still in beta stage, everything worked very slick in our testing.